Doctor Patricia Voelpel is a Clinical Associate Professor at Stony Brook University School of Nursing. Doctor Voelpel received her Bachelor of Science in Nursing from Molloy College, her Master of Science and certification as an Adult Nurse Practitioner from Stony Brook University, and her Doctorate of Education from Dowling College. 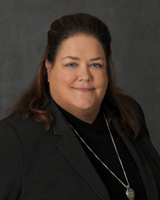 Doctor Voelpel was the director of the 12 Month Accelerated and Basic Baccalaureate Nursing Programs from 2002-2014, Program Director for the Veterans Bachelor of Science Nursing Program (2014-present) and Coordinator of Dedicated Education Units (2012-present). As of the Fall 2016, Doctor Voelpel was named Program Director for Undergraduate Special Programs which includes the School of Nursing Scholars Program, the Veterans Bachelor of Science Program and the Dedicated Education Units. She holds national certification as a Critical Care Nurse (CCRN) and her clinical experience is primarily in critical care. Doctor Voelpel is a two time recipient of the Long Island Jewish Medical Center‘s Nursing Center of Excellence Award, the 2014 and 2017 award recipient for Outstanding Teaching and Service to the School of Nursing, the recipient of the 2017 Stony Brook Medicine Dean's Award for Excellence in Education, and the 2017 Stony Brook University nominee for Nassau-Suffolk Nurse of the Year award. She is a member of the American Association of Critical Care Nurses (AACN) since 1993. Doctor Voelpel was inducted into Sigma Theta Tau, Kappa Gamma chapter in 1997 and maintains her membership. Doctor Voelpel’s dissertation research was in leadership development and clinical decision making. Mentoring, clinical excellence, and fostering leadership for my students and colleagues drive my program of scholarship. Mentoring provides the foundation to achieving both excellence and leadership in nursing. I appreciate interpersonal differences in learning styles. As a result, my innovation as an educator is to create tailored programs of mentorship for every student. I have successfully mentored students ranging from the academically challenged to the extremely talented. I spearheaded the development and approval of a competitive Scholars Program for students to be directly admitted into the School of Nursing as freshman. The program will open August of 2017. I also have come to appreciate the unique needs of veterans returning to school to become nurses. Ultimately, the goal is to attain the characteristics of clinical excellence and leadership with every life I touch in my work as an educator. I was instrumental in Stony Brook University School of Nursing being designated a Military Friendly School in 2016 and again in 2017. Our veterans have experiences that civilians will never fully understand. That being said, I know it is important to create safe environments for them to communicate and learn. Consequently, I am the program director for using equine therapy to improve communication, decrease stress, and develop coping skills to support success among our veteran students. Our data supports the effectiveness of equine therapy in achieving the stated goals. Based on the outcomes to date, we plan to continue the program and have requested a funding extension to support it over the next one to two years. My doctoral research examined factors that attributed to the development of strong leadership among newly graduated registered professional nurses working clinically. My findings suggest that nurse educators place great emphasis on development of nurses’ ability to lead others. However, a gap exists in nurses' ability to make decisions for themselves, otherwise known as the ability to self-lead. I am continuing this line of inquiry by investigating methods to assist faculty to better develop self-leadership. Ultimately, my goal is to develop strong leaders in the clinical arena who will drive and sustain excellence in patient care. The Dedicated Educational Unit (DEU) is one initiative I use to support leadership development. I train the clinical faculty for these units to execute the clinical curriculum for our students. The program is highly successful with students reporting achieving quality clinical education and subsequent rapid transition into practice. The DEU program began in 2011with 3 designated units in one hospital. The program is thriving with 9 DEU's in 4 different institutions. My work as an educator involves developing curriculum to assure nursing students are prepared to work as team members and leaders to provide quality care and improve outcomes. My philosophy of teaching is based on achieving student engagement and understanding. Students are always encouraged to ask questions and share experiences. To support engagement, various methods of teaching are used in the classroom (e.g. interactive lectures, team-based learning activities, live demonstrations, videos, and adaptive testing) recognizing that students come with different learning styles. Course content is reviewed and updated each semester with current research and evidence-based practice. Students are encouraged to share constructive feedback and future coursework is adjusted accordingly. Finally, I enthusiastically support the mission of the school because I am dedicated to the delivery of high quality education to diverse populations of nursing students. Messina, B.A., Steckel, A., & Voelpel, P. (2008) A pilot program for maximizing faculty productivity in the clinical setting. Nursing Education Perspectives, 29 (4), 198-199. Voelpel, Patricia E.  (1997) Reflections:  The Unseen Force. American Journal of Nursing: 97(3), 50. Voelpel, P & Escallier, L.  (2016). HRSA Webinar. Equine enlightened journeys and healing of student veterans. Messina, B, Steckel, A & Voelpel, P. (2007). A pilot program for maximizing faculty productivity in the clinical setting. Paper presented at AACN Baccalaureate Education Conference. New Orleans, LA. Paciella, M & Voelpel, P. (2007). A model of collaboration between a tertiary care hospital and a school of nursing expands nursing programs and promotes recruitment. Poster presented at AONE Annual Nursing Conference. Washington, DC. Voelpel, P. (2006). Relationships between nursing students’ SAT math scores and their beliefs about mathematics. 11th Annual Nursing and Health Professions Educator Conference. Southern Indiana University, IN. (Paper Accepted). Voelpel, P & Galiczewski,J. (2016). Using Explain Everything can make teaching fun. Stony Brook University, School of Nursing. (Podium Presentation). Voelpel, P. (2016). Communication. Stony Brook University Medical Center. Division of Nursing. Preceptor Development Day. (Podium Presentation). Voelpel, P.  (2015). Baccalaureate nurses:  ability to lead and clinical decision making. Stony Brook University School of Nursing Research Day (Podium Presentation). Voelpel, P.  (2013). Communication. Stony Brook University Medical Center. Division of Nursing. Preceptor Development Day. (Podium Presentation). Voelpel, P.  (2012). Communication. Stony Brook University Medical Center. Division of Nursing. Preceptor Development Day. (Podium Presentation). Voelpel, P.  (2011). Communication. Stony Brook University Medical Center. Division of Nursing. Preceptor Development Day. (Podium Presentation). Voelpel, P.  (2010). Communication. Stony Brook University Medical Center. Division of Nursing. Preceptor Development Day. (Podium Presentation). Voelpel, P. (2007). Sharing a goal:  utilizing innovative methods for delivery of nursing clinical education to foster clinical research. Paper presented at North Shore Long Island Jewish Healthcare System Annual Research Conference. Stony Brook, NY. Voelpel, P.  (2007). A model of collaboration between a tertiary care hospital and a school of nursing expands nursing programs and promotes recruitment. Poster presented at Stony Brook University School of Nursing Annual Research Day Stony Brook, NY.